Walnuts are a delicious way to add extra nutrition, flavor and crunch to a meal. While walnuts are harvested in December, they are available year round a great source of those all-important omega-3 fatty acids. 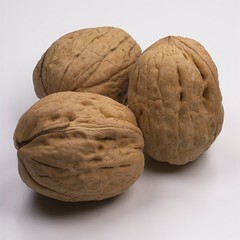 It is no surprise that the regal and delicious walnut comes from an ornamental tree that is highly prized for its beauty. The walnut kernel consists of two bumpy lobes that look like abstract butterflies. The lobes are off white in color and covered by a thin, light brown skin. They are partially attached to each other. The kernels are enclosed in round or oblong shells that are brown in color and very hard.